You can customize the file types that display in any folder using the Project Properties dialog box. For details, see How to Customize Directories for Virtual Folders. To change the display, see How to Customize Display of File Types. You can rename a component to identify its function in the project or remove a component that is no longer used. You can rename and remove components, such as folders, subfolders, HTML files, Master Files, and procedures. For more details, see How to Rename a Component. To remove a component, see How to Remove a Component. Select and right-click the project. Select New from the context menu, and click Virtual Folder. 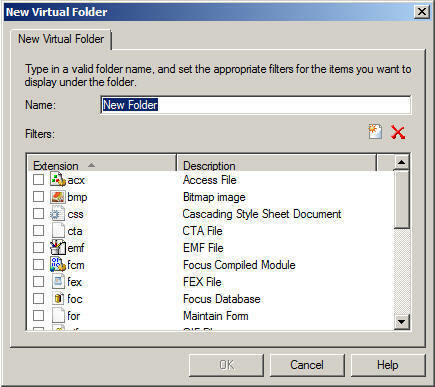 The New Virtual Folder dialog box opens, as shown in the following image. In the Name field, enter a name for the new virtual folder. Customize the list of file types that will be displayed in the folder. File types (filters) already defined in the project are shown in the list box. Click the check box next to a file type in this list to add it to the new folder. To add a file type not shown in the list, click the Add new file type filter(s) button . The New Filter dialog box opens, listing the file types registered with the operating system. The following image shows the New Filter dialog box. Scroll through the list and select one or more file types. Click OK when you are done. The selected file type is added to the list. To remove a file type from the list, select it and click the Remove file type filter(s) button . Confirm the deletion as prompted. Click OK on the New Virtual Folder dialog box to close it and return to the Explorer. The sample window in the following image shows a new folder named Text Files, which includes .log files used by the project named Sales. Tip: You can also customize file types and directories visible in a project from a drop-down list. To access the drop-down list, click the down arrow next to the Filters button on the Explorer toolbar. The drop-down list is shown in the following image. 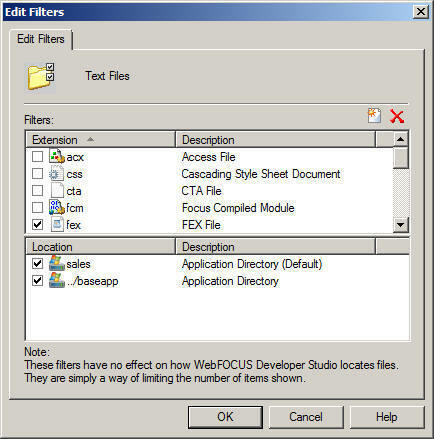 Highlight the Procedures folder in a project that has virtual folders and click the Filters button on the Explorer toolbar. The Edit Filters dialog box opens, as shown in the following image. The Location list box shows the directory paths associated with the project. By default, the boxes next to directory paths are checked. Click the box to deselect it if you want to hide files from a directory that is set in the project search path. Click OK to apply the changes and close the Edit Filters dialog box. Tip: You can also customize file types and directories from a drop-down list. To access the drop-down list, click the down arrow next to the Filters button on the Explorer toolbar. Select and right-click the component. Select Rename from the context menu. Type the new name at the cursor location. Select and right-click the component. Select Delete from the context menu. If you are deleting a virtual folder, select Delete Virtual Folder. Click Yes to confirm the permanent deletion.